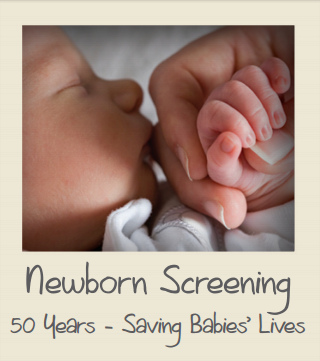 Newborn screening prevents 12,000 babies per year from death or lifetimes of intellectual or physical disability. It started in the US 50 years ago. New York started infants screening in 1965 for phenylketonuria (PKU) and today babies are screened for 45 disorders. New York was the first state to test for sickle cell anemia in 1975 and the first to introduce universal screening for HIV exposure in 1997. In 2006, New York was also the first state to screen all babies for Krabbe disease. Screenings are also conducted for cystic fibrosis, congenital adrenal hyperplasia, primary congenital hypothyroidism, and severe combined immunodeficiency. In December 2013 New York will also be the first state to screen for adrenoleukodystrophy (ALD), a rare genetic condition, which affects the nervous system. Yesterday New York State Health Commissioner Nirav R. Shah M.D., M.P.H was at the Wadsworth Center to visit a national exhibit designed to raise awareness of the importance of newborn screening. the Wadsworth Center screen 250,000 infants every year.